JACKSONVILLE, Fla., Dec. 6, 2018 /PRNewswire/ -- Healogics®, the nation's largest provider of advanced chronic wound care services, today announced their research series addressing the social determinants of health. The World Health Organization (WHO) defines social determinants of health as the conditions in which people are born, grow, live, work and age, that shape health. These factors include characteristics such as socioeconomic status, education, neighborhood and physical environment, employment and social support networks. Surprisingly, these social and environmental conditions account for 80 percent of health outcomes while only 20 percent are the result of care delivery. "Over the next year, we will release a series of findings based on surveys of clinicians, interviews with patients and secondary data analysis," said Hanna Gordon, PhD, Healogics Executive Director, Research and Informatics. "Our goal is to ensure that all patients can access high quality care and heal their chronic ulcers. We will begin our series with an introduction to the social determinants and how they impact health outcomes, followed by the findings of a survey on clinician perspectives on social barriers to care, and original research on the sociogeographic patterning of chronic wounds." Chronic wound patients face a number of challenges to their health and well-being. The presence of ulcers is an indication of broader physical systems failures. However, with education, many wounds could be prevented or treated when they are less severe resulting in improved outcomes. The association between chronic conditions such as diabetes, cardiovascular disease and social conditions is well established, yet none of the previous studies have addressed chronic ulcers. 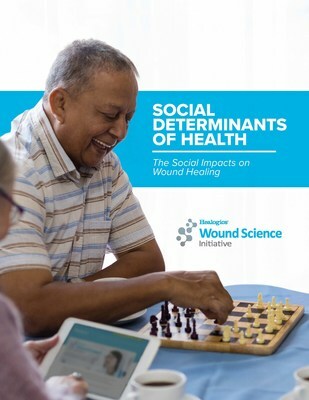 Healogics Wound Science Initiative is partnering with hospitals and researchers to better understand how the social determinants of health impact the lives of wounded patients. "Through this exploration, we intend to utilize quantitative and qualitative data to demonstrate the complexity of the wounded patient population," said Mike Fogarty, Healogics Chief Operating Officer. "This includes all of the factors that play a role in healing, increasing awareness of barriers to patient care, improving patient-provider communications and decreasing obstacles to patient adherence." Healogics is focused on improving the care of people living with chronic, non-healing wounds. The Wound Science Initiative, launched in 2017, strives to advance the science, awareness and practice of wound care through research, technology and collaboration. Healogics is achieving this by leveraging their wound care database, as well as partnering with academic and scientific leaders to produce research briefs, white papers, presentations and manuscripts. Ultimately, the Wound Science Initiative will be used to help improve patient outcomes and aid in effectively managing this growing population through data-driven initiatives.